We've spared no effort to ensure prototyping with Fluid UI is fast. Everything is streamlined, usable and in one place. Prototype quicker using over 2000 built in components. Choose from Material Design, iOS, Windows and Wireframe libraries. Already have graphic assets? Easily add them to your prototypes or save them to your own personal libraries for future use. Create interactive web and mobile prototypes with taps, swipes, clicks and more gestures using Fluid UI's simple and fun to use linking system. Different page animations make your prototype unique. Pop in, fade in, flip or just show - beautiful animations help bring your prototype to life. Adding links to your prototypes also doubles as your screenflow - a beautiful graphic that shows how your pages relate to each other. Fluid UI sets the standard in online prototyping. Design prototypes together at the same time. All your work is saved in the cloud and immediately available to everyone in your team. Set up a prototyping meeting in Fluid UI and see your entire team's work happening in real time. Get on a video call while still prototyping. Discuss and implement ideas at the same time. Other collaborators can watch as you make changes, sharing ideas and improving your prototypes. Get your entire team working together. Fluid UI supports unlimited users and prototypes. In reviewer mode, invite anyone to click through your prototype, chat together and add annotations for everyone to see. Present your prototypes in interactive video calls with clients no matter where they are in the world. Request, respond and resolve comments to incorporate feedback into your prototype before development begins. 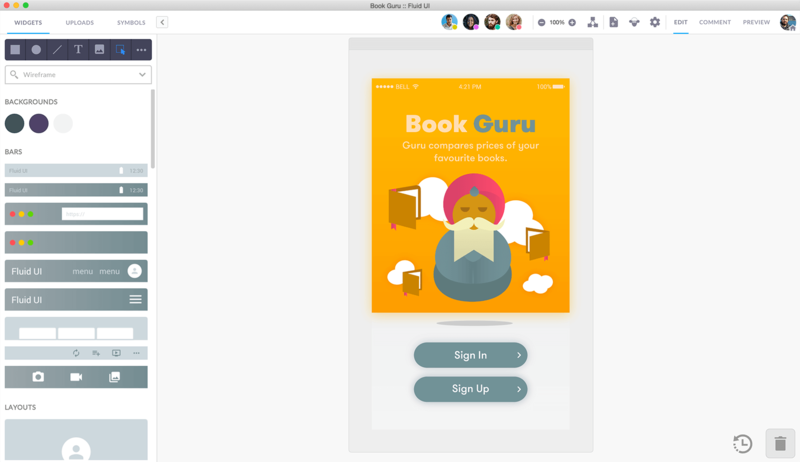 Test prototypes with users in remote user testing sessions. Watch how they interact and let them talk about their experience. Got a question? The Fluid UI team are online 16 hours a day to answer you with our built in chat support. If you have a budget and need a team to move your idea forward, talk to us and we can bring help your prototype to life. Fluid UI runs smoothly in Firefox and Chrome - so pick your preferred browser and get prototyping. Everything will sync automatically. Want an even more powerful, full screen prototyping experience? Install the desktop client and get a native performance boost. Building a mobile or tablet app? Install the Android or iOS apps to preview your prototype on mobile as you design.